Dan Weston is a data analyst who is trying to break cricket's traditionalists and conformists with a numbers based approach. Here he talks about the mistakes that T20 teams make in ignoring key number based data. Think about T20 cricket leagues around the world and what comes straight to your mind? Sixes, boundaries galore, fireworks, music, cheerleaders and dancers, cricketers mixing with celebrities, and so on. Cricket's T20 leagues around the world, and the IPL in particular, are big entertainment extravaganzas that mixes the glitz and the glamour with cricket! Twenty years ago, it would not have even been considered cricket by the purists. The same purists today believe that cricket should be played according to a certain tradition. And the same goes for analysis. Their ways of analyzing the game are also traditional. Playing conditions and formats have changed over the years, and the way the game is played now is also different from how it was in the past eras. Similarly, the way the game is analyzed should also change and that is what data analyst Dan Weston is doing. He does this for all countries where cricket is played, including India, where the IPL is currently being staged, a tournament where the Chennai Super Kings are favorites on the back of their supremacy in the league over the past decade and more. 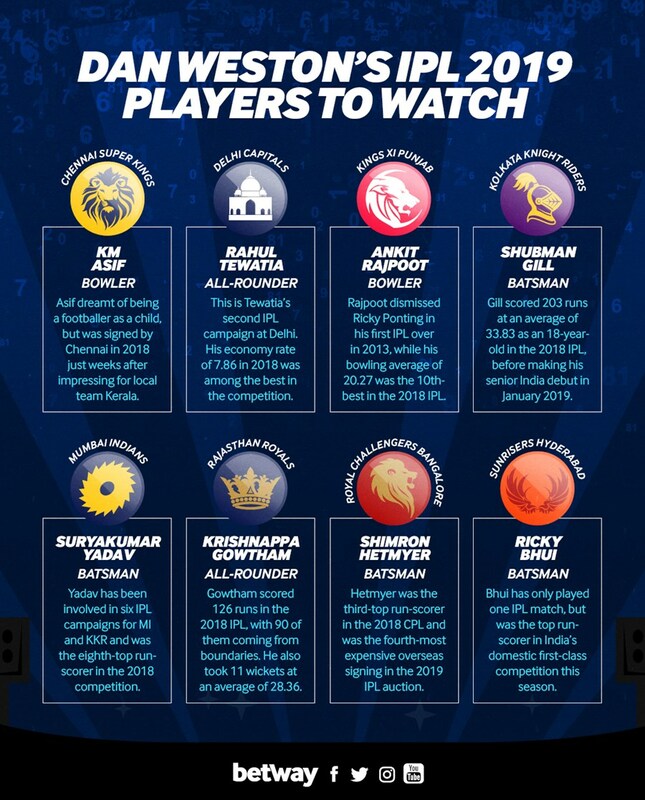 Check out online bookmakers or try betting with Betway and you will see how highly rated the Super Kings are. “If a bloke like myself can sit in an office and produce decent theories and data about T20 cricket, then I see no reason why a team with bigger resources can’t do the same,” he says. This has resulted in Weston limiting his public data analysis. Weston analyzes cricketers across formats and across different playing conditions around the world. He uses his data and numbers collated through millions of ball by ball data to predict certain outcomes for players. Weston became a cricket analyst after producing exhaustive data on tennis, which he utilized to bet on tennis matches. Once he realized that his tennis data and analysis could be transferred to cricket, he figures that he could make cricket analysis more suitable to today's times by applying his learning. According to Weston, errors being made in the sport. He says “you name it, they’ll make that mistake, be it selection, recruitment, in-game tactics”. This led him to set up a data analytics business, which will support cricket teams, players, and agents by eliminating errors and providing more accurate and suitable data to make the decisions required to succeed. He analyzes each player individually by going through his recorded ball-by-ball data and makes adjustments to the players' average, strike rate, economy rate, etc. based on recency, opposition, and playing conditions. Based on this analysis, Weston determines the expected performance for each player for an upcoming tournament. Basically, Weston produces a comprehensive assessment of how a player will perform in an upcoming competition, based on which he recommends players to teams around the world, including for the IPL, Big Bash, T20 Blast, and others. Weston says that what he does can easily be replicated by teams. “Lots of high-profile players are signed based on reputation rather than current ability. Take Brendon McCullum: he’s got a poor record against spin bowling, he doesn’t keep wicket anymore, yet subcontinental teams are signing him as a marquee player. It makes no sense whatsoever." “Then you see players signed based on reputation from another format." Weston believes that at times teams tend to cram a lot of versatile players into one team, which decreases the impact they can have on a game. Weston in fact has the data and numbers that prove the effectiveness of specialists in T20 cricket. “You don’t want to stick an all-rounder at No. 9 because he’s just not going to bat,” he says. “The average No. 8 faces about seven balls per match, and the average No. 9 faces about four balls per match. If those guys are required to face more than the average, your top order batsmen haven’t done their job properly." It is quite strange that even with such brilliant insights, Weston is seeking out more work rather than turning it down. He says that he knows that teams from around the world were using his work without engaging him as a consultant. “That includes guys like Wayne Madsen, who had never had an overseas contract before." “A lot of the time people say they don’t have the financial capabilities to pay for my work, but I don’t buy into that theory at all. You can’t tell me that a cricket team has no financial wastage." Weston believes that cricket coaching and analysis is starting to change. He believes that younger coaches will bring on more emphasis on data analysis, the kind that he produces. When this does happen, it will lead everyone back to the efforts of one Dan Weston. Who will you pick in Pakistan's 15 for the ICC World Cup 2019? The deadline for submitting World Cup squads is 30th April 2019 and Pakistan is done with all its international assignments till then. Pakistan's 5-match ODI series against England will start on 8th May, so it is only logical that Pakistan's World Cup squad plays that series. Considering Pakistan is planning to send the team to England by 24th April for acclimatization and practice matches against county sides, the selectors have 20 odd days to make up their mind about the 15 that will play the ICC World Cup 2019. Several players, namely Haris Sohail, Mohammad Rizwan, Usman Khan, and Abid Ali built a solid case for inclusion during the just concluded ODI series against Australia. Inzamam and co. have a tough job now on their hands as a number of players have demonstrated good performances. Let us take a look at the probable World Cup Squad composition. In my view, the 15-man squad should comprise 7 batsmen, 1 wicketkeeper batsman, 2 spinners, and 5 pace bowlers. This leaves 1 batsman and 1 pacer to be selected. I believe the race is between Mohammad Rizwan who knocked two centuries against the Aussies and Abid Ali, the debutant centurion. A number of experts and fans have been calling for Asif Ali's inclusion in Pakistan's ODI team. I don't understand how they think. Has everyone forgotten what a miserable failure he was in ODIs for Pakistan? Sure, Pakistan has not seen a better six hitter since Afridi than Asif Ali, but he is at best a T20 player and does not fit into an ODI team. He cannot bat at 6 because if required to bat before the 30th over, which will be more often than not for Pakistan, Asif cannot fulfill the role. And playing him at 7 means you sacrifice a bowler, which makes no sense. 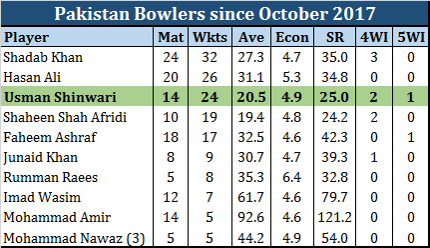 At best Asif is an Afridi who cannot bowl, which basically means he is useless. Pakistan has enough lower order firepower in Imad, Faheem, and Hassan all of whom contribute with the ball as well, so really, Asif is not required. Umar Akmal and Shan Masood had the perfect opportunity to put on some solid performances and impress the selectors during the ODI series against Australia, but neither did enough, besides looking good in spurts, to push their case. So it will all come down to whether Pakistan want a reserve opener or a reserve middle order batsman. Both Rizwan and Abid can double up as a back-up wicketkeeper. It will be a tough choice between the two for Inzamam and co.
For me, I would go with Abid Ali for the sheer quality of his innings against Australia. The confidence, stroke play, and timing that he showcased in his debut innings puts him ahead in the race in my opinion. If Hafeez does not recover from his injury in time, then Rizwan will make the squad as well. Abbas could not replicate his test success in ODIs, Hasnain was far too raw despite showing some good pace, and Junaid was way too inconsistent. Aamir's form has been lacking for a while now, but considering that he is a big match player, he should get the nod for a World Cup spot. Aamir will play in place of Shadab whenever the conditions favor seam bowling. I believe 5 is the best position for Sarfraz and he should bat there throughout. I have also heard that he himself wants to bat at that position. Hafeez has displayed his big hitting ability on more than one occasion and is best suited for number 6, unless he is unfit in which case Malik should assume that role. Pakistan will play 2 ODIs against county sides, 5 ODIs vs England, 2 warm up ODIs before opening their World Cup campaign on 31st May 2019 against the West Indies. In my opinion, it is these 15 players who should be named for all these games and the World Cup! Imam Ul Haq has faced it since the day he made his debut for Pakistan, while Usman Khan Shinwari has lately got some stick as well. It is not only the largely emotional fans but even well read ones and experts who have questioned the inclusion of Usman Khan in Pakistan's ODI team with comments like "he has off days when he is slaughtered by the batsmen". Well I don't remember any such day in Usman's short ODI career. In 14 ODIs, he has picked up 24 wickets at a remarkable average of 20.5, a strike rate of 25.0, and an economy rate of 4.9! Such a record does not show any off days to me. In fact, out of the 14 ODIs that has has played, he has gone for over 6 an over only thrice - vs India in Dubai (6.75), vs South Africa in Port Elizabeth (6.12) and vs South Africa in Cape Town (6.14). Besides these 3 matches, his economy has been well below 6, and in most cases below 5! The problem the general public has is with the way he gets hit around in T20 cricket. Well who doesn't get hit around in T20s? Usman Khan in ODIs has been nothing short of spectacular! In the period starting from the time he made his debut for Pakistan in October 2017, he has been one of Pakistan's best ODI bowlers. 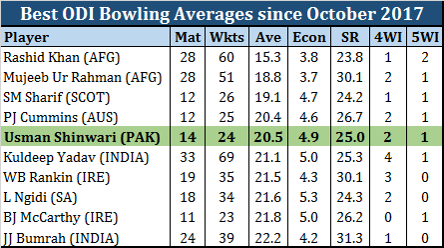 Usman is Pakistan's 3rd highest wicket taker during this period, with an average and strike rate that is behind only Shaheen Afridi's ! Off days you tell me? None whatsoever! In fact, his ODI average is among the best in the world in all matches played since he began his ODI career. Now that this is settled, let us take a look at Imam Ul Haq's career. For starters, for someone who made an ODI century on debut to still be called a 'parchi' is just criminal. Imam is Pakistan's most consistent and most reliable batsman after Babar Azam. In 24 ODIs, Imam averages 55! He has hit 5 centuries and 5 fifties. Moreover, 4 of his ODI centuries and 4 of his ODI fifties have come in wins. He averages a phenomenal 84.5 in ODIs that Pakistan has won while he has been in the side. 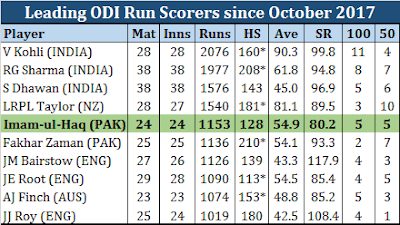 In fact, in the period starting from when he made his ODI debut in October 2017, Imam is Pakistan's leading ODI run scorer. In this period, he has scored more runs than Fakhar Zaman and Babar Azam, and that too at a better average! He has the most ODI centuries for Pakistan during this period as well. And yet he is labelled a 'parchi'? WHAT A JOKE! 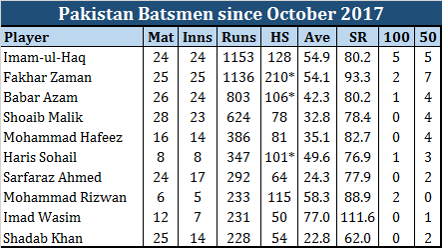 Even when compared with the best batsmen in ODIs over this period since October 2017, Imam is right up there among the best in the business! I hope this settles the debate once and for all! Imam Ul Haq is not a parchi and Usman Khan does not have off days in ODIs. Both are the best that Pakistan have in their respective trades. During the whole of last summer, and more than likely the whole of this summer, questions will be asked about the England batting line up, particularly the top order. England were already struggling to find a new opener before Alastair Cook retired and, without him, that has become an even tougher task. However, despite their issues at the top of the order, it will be the bowlers that decide where the Ashes go this summer. Will England win them back on home soil, or can the Aussies retain them away from home? The latest Cricket betting has England as the 4/5 favourites to win the series on home soil, with Australia at 7/4. What England lack in their batting, they make up for with their bowling and, at home, they are ten times better than when playing away. You can forgive them their performances in the West Indies recently - this team comes to life and tears teams apart when playing at home. It is these bowlers that will bring the urn home for England this summer. Jimmy Anderson leads the attack at the ripe old age of 36, but there is still plenty of fight left in him yet, and more than enough for one more Ashes series. Anderson has taken the most wickets ever by a fast bowler in test cricket, after overtaking Aussie Glen McGrath recently. Stuart Broad is 5th on the same list and, just like Anderson, he thrives on the conditions that he faces when playing at home. Broad will play this summer, but he was left out against the West Indies, showing that England have a lot of options behind him, and plenty of other faces to call upon if needed. Perhaps the most exciting bowler in English cricket right now is Sam Curran, and he could really burst onto the scene with a big performance this summer. He loves to get the ball swinging, which makes him perfect for English conditions and you can picture him giving the Australians a lot to think about when they head out to the crease. The final player to mention is someone trying to force his way back into the team, and that is Mark Wood. He is quicker than all three of the above-mentioned bowlers, and gives England something different in their attack. Chris Woakes is a player who could also play, but he struggles for opportunities as he is too similar to Anderson, Broad and Curran. With Wood, England have a genuine quick man, and another line of attack if the swing movement is not there for the other bowlers. With all-rounder Ben Stokes also available to come in and bowl a few overs, the English seam attack looks to be primed and ready to take care of the Aussies this summer. The depth they have is likely to keep the likes of Stuart Broad on his toes, and that should spur everyone on to be at the top of their game, as no one wants to be left out of the Ashes. England have been on an imperious march to the World Cup since their failure in the competition four years ago in Australia and New Zealand. The Three Lions were humiliated, failing to reach the knockout stage of the tournament. Eoin Morgan’s men played a brand of tepid cricket that put them well behind their rivals at the top of the sport. Their failure proved to be a watershed moment for England in one-day cricket and inspired a revolution in their style, which has made them the front runners for the World Cup. Over the last three years, Morgan’s men won nine bilateral series in a row before their surge was ended against the West Indies in a draw in the Caribbean. In their run, they defeated Australia home and away, New Zealand and Sri Lanka on the road, along with a narrow 2-1 victory over India last summer. The Three Lions are a machine in the 50-over format, boasting the best batting unit in the world, while Adil Rashid has developed into one of the leading spin bowlers in the world. England have few weaknesses, although the most glaring of them were exposed in their series against the West Indies. Their batsmen have been on song for 90 percent of the time since the last World Cup, but they have still displayed a propensity to stage dramatic collapses. Their defeat to Pakistan in the semi-final of the ICC Champions Trophy was a case and point, while further meltdowns against Sri Lanka last year and the West Indies in the final match of the series. England’s ability to mount huge totals has been their biggest strength since the last World Cup. It results from their aggressive style of play that has seen them break the world record for the highest ODI total twice, coming within 19 runs of being the first team to post 500 last year against Australia. However, the same attitude can also result in rare failures. It only takes one of those days to halt their charge at the World Cup. Although Joe Root does not boast the same striking ability as the rest of his team-mates in the line-up, he could be the Three Lions’ most important player in the tournament. He plays the anchor role to perfection, allowing the rest of the unit to tee off around him. Root displayed that ability with back-to-back centuries against India in 2018, and it’s the reason why backing him to lead the way at the tournament with the most runs would be one of the best betting tips available, especially in familiar conditions in England. The Three Lions have also been exposed at times in their bowling ranks. Without James Anderson and Stuart Broad in the 50-over game, England lack a world-class seam option. Chris Woakes has had his moments, although, on other occasions, he has been cannon fodder. In the Caribbean, Chris Gayle took him to task with ease and there are other openers that are also capable. Mark Wood proved his worth in the ODI series against the Windies. He could be England’s ace card in the World Cup, highlighted by his match-winning spell of 4-60 to stop Gayle and company chasing down 418 in the fourth ODI. Wood has the raw pace to trouble the leading batsmen in world cricket. Paired with Rashid, it provides Morgan with a dangerous one-two punch to turn a match on its head. It will still take a complete effort from England to clinch their first World Cup crown, but they have star men that can put blemishes on their few weaknesses heading into the tournament. Pakistan recently announced a 16-man squad for the 5 match ODI series against Australia, which will be played in the UAE, starting 22nd March. Pakistan have decided to rest a number of their key players, including captain Sarfraz Ahmed, keeping in mind the hectic PSL schedule and the upcoming ICC World Cup. There are more ODIs to be played leading up to the World Cup so Pakistan can afford to rest the likes of Babar Azam, Fakhar Zaman, Shadab Khan, Hasan Ali, and Shaheen Afridi who have been playing all formats for Pakistan since the start of this season. This also gives the Green Caps a chance to test their bench strength and build a strong squad for the World Cup. There are still a few places up for grabs in the 15-man WC squad, and this series against Australia will help the selectors decide who will be on that plane to England in the summer. Here is a look at the new additions to Pakistan's ODI squad. In my view, Fakhar, Imam, Babar, Hafeez, and Malik are automatic selections for Pakistan's World Cup Squad, which leaves space for two more batsmen. Asif Ali wasted the ODI opportunities he was given, and Hussain Talat did not do enough either to grab his chances. This sets up the competition among the 4 new names in Pakistan's ODI squad and any of these two have the chance to make it to the World Cup by impressing the selectors and team management against Australia. Not a new name for anyone, but the last time Umar Akmal played an ODI was over two years ago in January 2017. He still has a healthy average and strike rate in ODIs but he was dumped by Pakistan following lackluster form that saw him make only two 50+ scores in his last 25 ODI innings. Umar has been in scintillating form in the PSL having scored 228 runs in 8 innings at an average of 38 and strike rate of 136.5. In addition to this, he has also performed well at the domestic level - in the Quaid-e-Azam One Day Cup he was among the leading run scorers with 410 runs in 10 innings at an average of 41. Umar Akmal has been given a great opportunity to extend his domestic form to the international level and cement a place in Pakistan's World Cup squad. He is also not a new name, however Shan is yet to play ODI cricket for Pakistan. While he has been in and out of the test team for the past few years, he has been on the fringes of ODI selection on the back of his magnificent domestic form. Shan's current List A average of 56.5 has just fallen behind Michael Bevan's, but a few months ago, Shan held the world record List A average. Shan had a breakthrough 2018, finishing the year as the leading run scorer in all List A matches. He amassed 1,789 runs in 30 innings at an average of 74.54. His 30 innings included 7 hundreds and 10 fifties! That run tally included 5 innings for Pakistan A against the England Lions, where Shan was the second highest run scorer between both sides, with 238 runs at an average of 47.6. With Fakhar rested for the series against Australia, Shan will definitely make his ODI debut and he is in with a chance to make the World Cup squad as a third opener. He is a domestic veteran having been around Pakistan's domestic circuit for the past 14 years, during which Abid Ali has played 91 List A and 102 First Class Matches. He averages 38 in both formats, which is not world class, but following a successful 2018, he was deserving of chance, which he has got now. 2018 was his most successful year yet, where he scored 1,318 runs in 24 List A innings, including 3 hundreds and 9 fifties. He ended the year with a List A average of 60! This included 299 runs in 5 innings in the Quaid-e-Azam One Day Cup where he averaged 59.8. His 5 innings included 4 fifties with a top score of 91. He got only two chances in the List A matches against England Lions, and in one of those he smashed 140. He was also among the leading run scorers in First Class matches against the England Lions and New Zealand A, scoring a century against each of the teams. Abid Ali will have to make the most of his chances against Australia to be in the running for the 1-2 batting spots that are available in Pakistan's WC squad. He has been around the domestic circuit for almost 7 years and has an impressive List A and First Class record, averaging over 46 in both formats. Saad impressed in the Quaid-e-Azam One Day Cup scoring 243 runs in 5 innings at an average of 48.6. He was also impressive in the only First Class innings he got against New Zealand A scoring 144. Like Abid Ali, Saad will also have to make the most of his chances against Australia to try and impress the selectors for a World Cup selection. Pakistan is spoiled for choice when it comes to pacers. The likes of Mohammad Aamir, Usman Khan Shinwari, Faheem Ashraf, Shaheen Afridi, and Hasan Ali are already in the fold. And for the upcoming series against Australia, Pakistan have recalled Junaid Khan, given a first time chance to Mohammad Abbas, and are also going to try out the raw pace of 18-year old Mohammad Hasnain. On the spin front, Shadab Khan and Imad Wasim should be the first pick for Pakistan's World Cup Squad, but Yasir Shah could also be considered if he can replicate his test form into ODIs in the series against Australia. It is going to be tough for Pakistan to pick 7 bowlers out of this talented line up for the World Cup. He is only 18 years old and has only played 2 First Class Matches and 4 T20 Matches - all of them in the ongoing PSL. He has picked up 5 wickets in the 4 PSL matches and has impressed everyone with his sheer pace, at times clocking over 150kmh! Considering Pakistan's battery of pacers, Mohammad Hasnain may find it tough to make it to the World Cup squad, but you never know what could happen if he excels in the ODI series against Australia. He has been Pakistan's Test spearhead for the past two years, picking up 66 wickets at an average of under 19 in the 14 tests he has played. He has an impressive List A record too with an average a shade under 28 and an economy rate well under 5. Yet he has never been tried in ODIs by Pakistan. He has had most of his test success on the docile UAE pitches, and he also spearheaded Pakistan's test win at Lord's last summer with an 8 wicket haul that got him the Man of the Match Award. His bowling style is well suited for English pitches and if he performs in the ODIs against Australia he could be the first name on Pakistan's team sheet come the World Cup. Injuries and indifferent attitude of the selectors towards him has kept Junaid in and out of Pakistan's ODI squads. He is among the senior bowlers for Pakistan and has a super international record with 104 wickets at an average of 27.8 and an economy rate of 5.2. In my view he is an automatic selection for the World Cup, but with this ODI series against Australia being considered his comeback, he would need to impress the right people given the number of left arm pacers Pakistan already has. In the 19 ODIs that Yasir has played, of which the last was in July 2018, he has never really excelled the way he has in Tests. He is Pakistan's go to spinner in tests, but Shadab and Imad have been preferred in the shorter formats. Including Yasir in the presence of Shadab and Imad along with the part time of Hafeez and Malik seems superfluous, and two leg spinners in a playing XI never really makes sense. I don't think Yasir has a chance to make it to the World Cup squad, and it could be that he was considered for this series to allow Shadab some rest. Pakistan are going into the series against Australia with 5 uncapped players - Shan Masood, Abid Ali, Saad Ali, Mohammad Hasnain, and Mohammad Abbas; and 3 players who are returning to ODIs - Umar Akmal, Junaid Khan, and Yasir Shah. It is the perfect opportunity for all of these players to display their talent and book a ticket to England for the summer. It will be interesting to watch how these players perform in the ODI series against Australia and who from there makes it to the World Cup party. Who Will Triumph in Cricket’s World Cup This Summer? Questions about the relevance – or otherwise – of the 50-over game refuse to go away, with the T20 format so popular globally and the ECB’s new 100-ball concept that will shorten the game yet further. That said, there’s nothing quite like the World Cup to get the juices flowing, and so the ODI tournament that will play out on English and Welsh soil between May 30 and July 14 is highly anticipated. There has been a format change to simplify the competition and keep supporters on the edge of their seats. Rather than the old Super Six grouping, now all ten teams will play each other in a round robin to decide the four best sides that go on to contest the semi-finals. It will accelerate the tournament and (hopefully) minimise the number of dead rubber matches and, while the newset-up has been criticised for minimising the number of associate nations that get the chance to compete on this global stage, at least the improving Afghanistan will have another opportunity to shine. Given their home advantage, England will start as favourite – that has been confirmed by the latest Cricket World Cup betting odds from Oddschecker, in which the Lions are priced at 23/10 to win their first ever 50-over world title. But they can expect fierce competition from the likes of India, South Africa, Pakistan and possibly even defending champions Australia. According to the ICC’s ODIrankings, England are the finest purveyors of 50-over cricket on the planet. India might have something to say about that, but in typically British conditions – green wickets and the ball hopping around, you would be hard-pressed to argue with the assertion of the bookies that England are a worthy favourite. Unlike the test team, which has experienced something of a tonking in the Caribbean this winter, Eoin Morgan’s red-shirted army is a settled team of outstanding performers in limited overs cricket. The exciting Jason Roy tends to get things off to an explosive start, while Jonny Bairstow, Jos Buttler and Morgan himself remain more than capable of magnificence. Arguably, Joe Root – free from the shackles of the test captaincy – is the jewel in the crown. The Yorkshireman is ranked fourth by the ICC, and his back-to-backcenturies in the series against India last summer proved to be pivotal. You could argue that the bowling attack is functional, rather than mind-blowin, but, even so, in Adil Rashid the Lions have a proven match winner. Cheered-on by a passionate home support, it’s hard to see England not reaching the knockout phase at the very least. There’s no doubt about it: India boast some of the best ODI players in the game. Virat Kohli and Rohit Sharma are ranked first and second in the ICC batting standings, while Jasprit Bumrah, Kuldeep Yadav and Yuzvendra Chahal are all ranked in the bowling top-five too. But do any of these players really thrive in English conditions? Kohli could bat well on the deck of a submarine, but that’s because he’s truly world class. As for the others, Chahal’s devilish spin is smothered by lifeless pitches and Yadav and Bumrah struggle to extract the bounce that makes them so effective elsewhere. Will Babar Azam be able to play the moving ball? Will Mustafizur Rahman be as effective in Britain as he is on the sub-continent? Cricket is becoming almost two different sports: one played in swinging conditions like England, New Zealand and South Africa, and one where spin bowling dominated in Asia. Naturally, in English conditions, it is the hosts who have a supreme advantage. What do you look for when buying a Cricket Bat? Cricketers across the world have a tough choice to make when choosing cricket bats resulting in various questions being asked before they make a purchase that could be the difference between a good and bad season. Which bat do I go for? Do grains make a difference? Which brand is the best? What is a sweet spot? Many of these questions run through a cricketer’s head before they make a decision – some think about these more than others. The revolution of cricket bats came with the experimentation of the distribution of weight, spearheaded by iconic bat-makers Gray Nicolls and John Newbury. This distribution ensured the cricket bat had a ‘sweet spot’, where the middle to lower half of the bat was dense, enabling more power to the blade resulting in the traditional cricket bat shape which is known all over the world. Each cricket bat brand have their unique story. Gray Nicolls for example, have been at the forefront of bat-making since their formation in the 1940s, resulting in iconic blades such as the Gray Nicolls Legend, the Gray Nicolls Powerspot and the Gray Nicolls Scoop – endorsed and used by legends in the game such as Viv Richards, Clive Lloyd, David Gower, Michael Atherton and many more. More recently, Gray Nicolls have added innovative touches to their bat ranges, offering a variety of modern day options whilst holding the traditionalist outlook to their brand. For 2019, Gray Nicolls have launched the Gray Nicolls Supernova, Gray Nicolls Powerbow 6X, Gray Nicolls Shockwave and carried forward their established Gray Nicolls Classic collection. Bat-making started a little later for Kookaburra with the brand diversifying from cricket ball manufacturing into bat-making in the mid 1980s. The Kookaburra brand grew into one of the household names in cricket with the help of over 27000 runs for the Australian national team by none other than Ricky Ponting. Entering its 17th year, Ponting’s endorsement of the Kookaburra Kahuna range will have undoubtedly played a huge part in the Kahuna being the most recognizable blade of the Kookaburra bat range. For 2019, Kookaburra have launched the Kookaburra Ghost, Kookaburra Nickel, Kookaburra Rampage, Kookaburra Glare, Kookaburra Charge and carried forward their established Kookaburra Kahuna collection. New Balance has bulldozed its way to the forefront of the cricket bat market with the help of endorsements from some of the world’s best batsmen such as Joe Root, Aaron Finch and Steve Smith – to name a few. Although still embryonic in comparison to larger brands like Gray Nicolls and GM, New Balance has produced high quality cricket bats coupled with aesthetically pleasing visuals, aiding its meteoric rise. Entering the bat market in 2012, their roster of established international cricketers is huge, often resulting with these players having huge impacts in high profile cricket matches, ensuring people take notice. Since its introduction to bat-making, New Balance has launched the TC and DC ranges with the introduction of the Burn range in the 2018 season. With over 130 years of bat-making experience, Gunn & Moore hand craft their bats in Nottingham, England. Having mastered the craft of bat-making, GM have been endorsed by some of the greats of the game including Michael Vaughan, Marcus Trescothick and the recent acquisition of England’s powerful All Rounder Ben Stokes adds to a long list of international cricketers. The unquestionable credibility of GM Willow has resulted in the brand becoming one of the leading bat-makers in the world. For the 2019 season, Gunn & Moore have launched the GM Diamond, GM Zelos, GM Neon, GM Haze, GM Mythos and the GM Noir. Selecting a cricket bat can be a tough choice to make but a decision every cricketer needs to make. After all, not every player has to bowl, but every player has to bat. Pondering over myths about cricket bats have forever been prominent in cricket retailers around the world. Although widely used in the cricket retail world, relentless bat tapping and ball tapping are not always the way forward when selecting your willow. Differing from bat to bat, the grains on a cricket bat are usually a respectable indicator on the quality of willow you are purchasing. Usually, cricket bats between 6 and 12 grains are a good measure of willow performance. However, the amount of grains can affect performance. For example, a bat with 6 grains is likely to be softer than a bat with 12 grains resulting in it needing to be used for large periods of time to reach peak performance. Whereas a bat with 12 grains will need knocking in for a short period of time and will reach peak performance quicker, the lifespan of these bats tend to be shorter. Universally, there are 5 grades which cricket bats can be segmented into with Grade 1 being the highest (as used by professionals) and Grade 5 being the lowest. As expected, the cost of a Grade 1 bat will be considerably higher than the cost of a Grade 5. The visual appearance of the blade will also need to be taken into account with straight and even grains on the high end blades with minimal marking/coloration on the high end cricket bats. The Profile on a cricket bat often indicates where the sweet spot is located. This is where most of the wood in a blade is located so when opting for a new willow, it’s crucially important the sweet spot is in the place which suits your style of play as well as the pitches you play on. For example, if you’re playing on slow, low pitches, it would be helpful you have a cricket bat with a low sweetspot whereas bouncier pitches would suit a high sweetspot. Ensuring that the ‘pick up’ of the bat is right for you is equally as important as any of the above. Testing the bat in your actual stance playing an array of shots is what is commonly used by professional cricketers to help them gauge whether the bat is right for them. After all, if the pick up of the bat feels too heavy and is going to hamper your chances of getting your hands through the ball quickly and efficiently, then this may not be the bat for you. In summary, there’s lots to think about when purchasing your cricket bat. After all, large amounts of money can be spent in selection so it’s important that you have peace of mind that the money you’re paying on the blade is not only justifiable, but well spent. For as long as Inzamam Ul Haq remains PCB's Chief Selector, poor Imam Ul Haq will have to bear the brunt of judgement calls and nepotism remarks. Such is our nation, that no matter how good someone performs, they will for some reason always feel he is in the team because of his legendary uncle who is the Chief Selector. I really never understood why so many people feel this way. Inzamam was appointed Chief Selector in April 2016. That was probably the most ideal time to select Imam Ul Haq considering he had just completed the best domestic season of his career, which included a career best first class double century. In fact, during one of the press conferences, soon after becoming Chief Selector, Inzamam was asked by a reporter why he had not selected Imam considering Imam was the the best performing opener in the domestic circuit. Inzamam's response was "Imam had not done enough to be considered yet". The first time Imam was selected in Pakistan's squad was for the ODI series against Sri Lanka in October 2017 - a good 18 months after Inzamam had been Chief Selector. The first time he was selected for the Test team was in May 2018 - a whole two years after Inzamam had been Chief Selector. Nepotism? I don't think so. In both cases, it was pure performance. Imam made it into the ODI squad after two solid domestic seasons and responded with a debut ODI century in a successful chase against Sri Lanka. He became only the second Pakistani, and 13th overall, to score a century on ODI debut. On his test debut, against Ireland, his composed unbeaten 74 ensured Pakistan a victory after they had been precariously left reeling at 14-3 in pursuit of 160. For all those who thought that Inzamam used his influence as Chief Selector to select Imam, why were these two sterling debut performances not enough to justify his selection? The remarks from the critics continued, despite Imam piling on the runs, especially in ODI cricket. Following his debut ton, Imam knocked three more in the ODI series against Zimbabwe. Sure it was Zimbabwe, but even then it takes plenty of work to be this consistent and focused. Before the start of the ODI series against South Africa, Imam was averaging 60+ in ODIs, and yet there were calls about how he should be replaced and that he was in the team only because of his uncle. 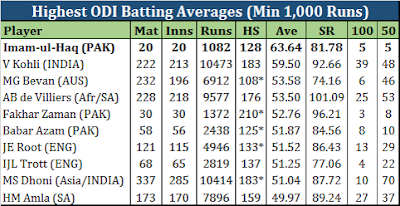 A 60+ ODI average damn it. How many other ODI batsmen have that? 4 ODIs into the series against South Africa and Imam still averages 63.6 following scores of 86, 5, 101, and 71. 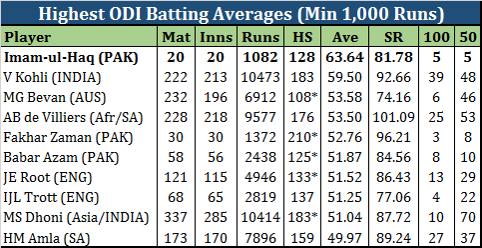 That average of 63.6 is the highest average among all batsmen that have scored at least 1,000 ODI runs (for countries with permanent ODI status). In a career that is very young, that is a great average. What is even greater about it is that in matches that Pakistan wins, Imam's average is a staggering 84.5! 4 of his 5 ODI hundreds and 4 of his 5 ODI fifties have all come in wins, demonstrating his contribution to Pakistan's ODI wins. The only ODI century that did not lead to a Pakistan win was last week against South Africa. Who knows what the result may have been had rain not played spoilsport. During the course of that century, Imam brought up his 1,000th ODI run, getting there in only his 19th ODI innings and becoming the second fastest to that mark, behind only his opening partner - Fakhar Zaman. In his young ODI career, Imam has fast become the most dependable batsman in the line up, after Babar Azam. As an opener, he is more reliable than the country's poster child - Fakhar Zaman. Sure, Imam's test career has not taken off the same way as his ODI career has, but that is no reason to continue making snide remarks against his position in the Pakistan team. Even Babar Azam took his time to settle down in whites. Even the world's greatest batsman took a while to establish himself as a test batsman - Virat Kohli averaged under 30 till his 8th test, and he did not consistently average above 40 till his 15th test. The first time it went above 50 was in his 52nd test! In tests, it will take time, but in ODIs there is absolutely no doubt that Imam deserves his position as an opener irrespective of who his uncle is. Pakistan have now played 4 ODIs at Port Elizabeth and haven't lost even one! That is quite a record for them in a place like South Africa. No one really expected Pakistan to win the first ODI. I mean our ODI team is worse than our test team, and with the way the test team was wiped out, it was really difficult to expect the ODI team to win anything. If you took a look at the best betting exchanges, no one would have placed their money on Pakistan. For starters, I felt Pakistan played the wrong XI. I had wanted Shan Masood, Mohammad Amir, and Shaheen Afridi to be in the starting XI. Leading up to the match a lot of people had said that they wanted Shan Masood to replace Imam Ul Haq at the top of the order. Imam averages 60+ in ODIs and you can't drop someone who has scored 4 centuries and 3 fifties in ODIs because of his failures in test cricket. Imam deserved his spot in the team and he also showed everyone why he should be Pakistan's first choice opener in ODIs. After this innings in the first ODI, Imam averages 64.6 and has scored 4 hundreds and 4 fifties in 17 innings! What I had actually wanted was for Pakistan to go in with a top 6 comprising Fakhar, Imam, Shan, Babar, Hafeez, and Malik. I feel Sarfraz at 6 is one position too high. He is not the batsman you want coming in at 50-4, which is something that happens to Pakistan quite often. I know that means playing a bowler short but Hafeez, Malik, and Fakhar should be able to provide 10 overs among them. Moreover in a place like South Africa, and England (during the WC later in the year), even Shan Masood can turn his arm over for a few overs. With the above mentioned top 6, followed by Sarfraz, Shadab, Faheem and any two pacers out of Amir, Hasan, Shaheen, Usman is a solid line up in my opinion. The fact that Pakistan won the first ODI with what was arguably not their best XI is quite heartening. The bowlers did a tremendous job restricting South Africa to only 266. They looked set for a 300 plus total but never really accelerated. It was a really odd scoreline seeing 266-2 on the board. Despite that, no one really thought Pakistan could chase 266. But Imam and Fakhar had different thoughts. They gave Pakistan a solid start and when Fakhar departed after a quick 25, Babar Azam took over like he does every time he bats in colored clothing. Imam held the innings together with a 45 run opening partnership, 94-run partnership with Babar, and a 46-run partnership with Hafeez. Imam has scored 4 ODI centuries, but this 86 was his best ODI innings in my opinion. After Imam left, it was all about Mohammad Hafeez. He was just sublime. Dale Steyn missing from the line up probably helped, but after beginning slowly, Hafeez just owned the game and never made it feel like Pakistan will not get there. It was great to see Pakistan win something on this tour after the embarrassing test losses, and it was heartening to see Pakistan win against a top team in ODIs, a format in which they have struggled heavily in recent times. With 2019 being the World Cup year, it is a fantastic start for Pakistan's ODI team. Around the middle of 2018, a friend working in the Dubai events industry asked me if I would be interested in a Junoon Reunion Concert in Dubai. Hell Yeah I would be! He then asked me to do some quick research on whatsapp by asking my friends the same question and also figuring out the price range they would be willing to pay to watch Junoon again. Majority answered YES! Many said they would fly down from Karachi if this were to happen. Some said that it will never happen. Junoon will never reunite. That was the first time I heard about Junoon possibly coming back together after 15 years to do a reunion tour. Excitement and anticipation had kicked off right then! Stories started coming out of Pakistan that Junoon was definitely coming back together. Peak Freans Sooper were doing something with them. Pepsi was planning something with them. A concert in Karachi was in the works. Then around October, Oberoi Middle East Events announced that Junoon will be performing at the Dubai Duty Free Tennis Stadium on 18th January 2019!!! Tickets to go on sale 26th November 2018!!! Excitement had gone through the roof. Within minutes of the announcement, whatsapp groups were buzzing with anticipation and soon I had a list of 20 people for whom I would be buying tickets for on 26th November. Leading up to the concert, there were a lot of mixed reactions. Some said it will be memorable and nostalgic. Many could not wait for the day to come. Some were skeptical at Junoon's potential to perform. Some felt Ali Azmat had lost his vocal chords. Some doubted their ability to perform together. For me and most of my friends, the excitement was at its peak. We could not wait to be at the Dubai Duty Free Tennis Stadium on 18th January. I was there at the same venue in 2005 when they performed here for the "last time". 14 years later - I was back again! And it was an absolutely EPIC 2.5 hours with Junoon!!! Ali Azmat still had it, Salman and Brian still had it, Junoon still had it! They completely killed it and left a 6,300 strong crowd totally overwhelmed. The concert, the performance, the music, the crowd, the atmosphere, the experience was just phenomenal! After 15 years, Junoon still had it in them to bring the house down. Through the night, they had 6,300 people up on their feet, singing, dancing, and feeling Junooni. It was a truly epic performance that transported each one of us back into the 90s and made us relive old memories. Never before have I seen a crowd so IN SYNC at a concert. Each one of the 6,300 people came out with all their Junoon! Full of energy, full of passion, a Pakistan-flag-waving-true-Junooni crowd! I felt it was one of the best crowds I have ever seen at a concert. Several friends said that this 6,000+ crowd had more energy than the 15-20,000 crowds they have seen at many other concerts. Junoon were fantastic! Their music, their coordination, their energy was simply awesome. They rocked the night and left an incredible after taste. It has been 3 days since the concert and I am still thinking about it and watching concert videos over and over again. A number of my friends, since this memorable Friday night, have been constantly listening to Junoon on Youtube, in their car, in the office, at home, wherever they go. I don't think I have ever felt like this after any concert. Here is a list of some moments, in no particular order, that made this concert so special for me and I am sure for everyone else too! Salman Ahmed's cue on the guitar was enough to get everyone in the mood to dream. Before Ali Azmat even sang the first words, there were 6,000 mobile phones up in the air with lit torches! It was a magical sight. This is what I mean by the crowd being IN SYNC. Even Ali Azmat let out a "wow". 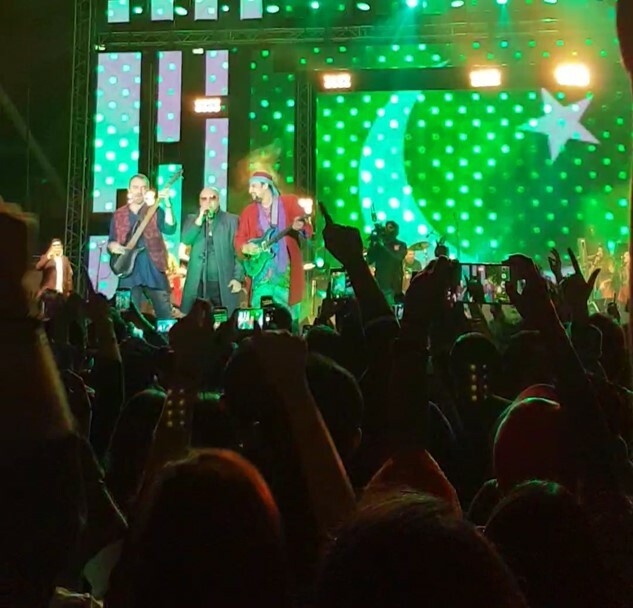 This not only brought Ali Azmat, Salman Ahmed, and Brian O'Connell together singing into 1 mic, it also brought the 6,300 people together singing along and headbanging to the music of Pakistan's biggest rockstars. One of my favorites, this one had the crowd hypnotized to another level. This particular part just brought out the goosebumps. In my lifetime, there have only been two songs that became the anthems for friendship - Yeh Dosti from Sholay and Yaaron Yahi Dosti Hai by Junoon. The best part about this was that I was there with my oldest and closest friend who I have known for 25 years, and with whom I have attended 4 Junoon concerts in the past two decades - this one being the 4th! 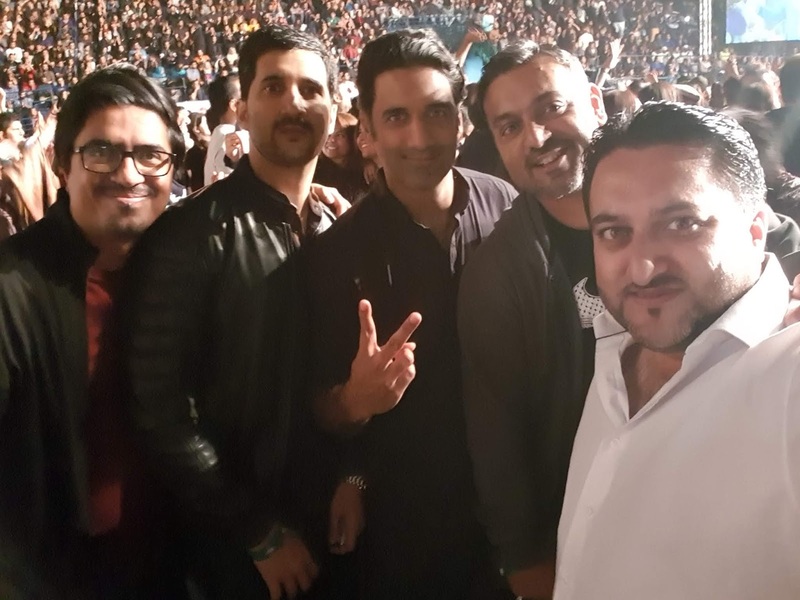 Like friendship, Pakistan's rockstars have also created cricket anthems, and similarly only two songs have gone on to become the cricket anthems of the nation - Vital Signs' Dil Dil Pakistan and Junoon's Jazba-e-Junoon. You might be tired of hearing about how IN SYNC the crowd was, but I really can't get over it. Every single one of the 6,300 people there was completely immersed into the atmosphere and sang this one louder than Junoon themselves. The only other place I have seen such patriotism from Pakistanis in a foreign land is at a cricket ground. This was simply awesome. The Dubai crowd, which not only comprised residents but visitors from all over the GCC, Pakistan, UK, USA, Australia, Singapore, and I'm sure some other places too, was just fantastic. 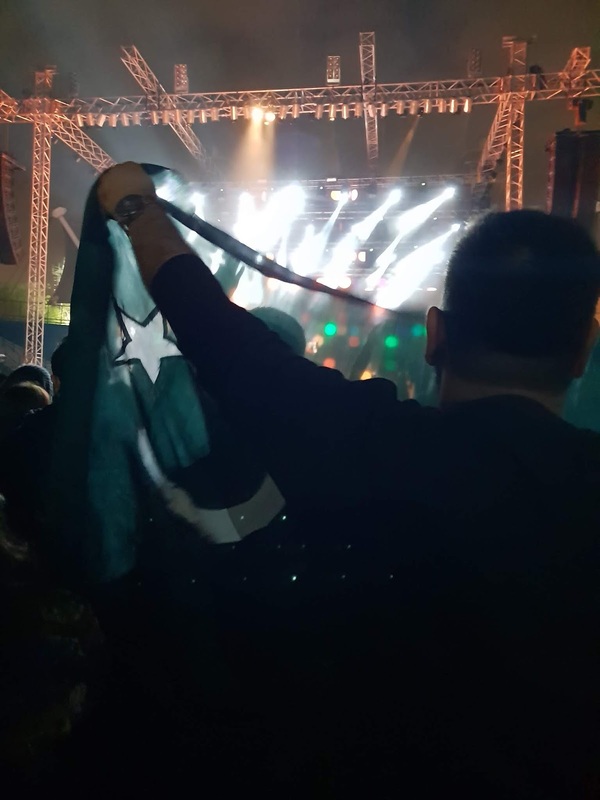 The concert ended, but the after effects remained as the crowd broke into a Pakistan Zindabad chant. Once again, IN SYNC ! Junoon left an everlasting impression, which will be difficult to get over. I guess by the time we are just about to move on from this epic night, it will be February 14th, and Junoon will be back in Dubai to perform at the PSL Opening Ceremony at the Dubai International Cricket Stadium. This Junoon hangover may never end and I won't really mind that! When Pakistan's greatest test batsman, Younis Khan, and most capped test captain, Misbah Ul Haq, retired in May 2017, we all thought; rather we all knew that Azhar Ali and Asad Shafiq were ready to take over the role of Pakistan's leading test batsmen. Till that time, Azhar and Asad had played all their test cricket in a batting line up that was built around the backbone of Younis and Misbah. Azhar made the number 3 position his own and even excelled as an opener; while Asad always provided solid support at number 6. Both of them excelled in their respective roles. So much so, that Azhar was Pakistan's leading run scorer in tests during the period between July 2010, when he made his debut, and May 2017, when Younis and Misbah called time on their careers. 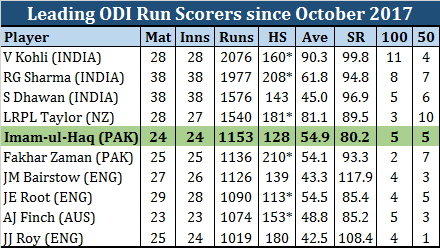 During this period, Azhar was also the 5th highest run scorer in tests, with only Alastair Cook, David Warner, Steve Smith, and Kane Williamson ahead of him. He scored more than the likes of Younis, Sangakkara, Kohli, Amla, and Root during these 8 years! Azhar truly excelled as an opener during this time, scoring a triple hundred, as well as a double hundred at the MCG! His average of 55 as an opener during this period (2010-17) was the highest among all batsmen who opened in at least 10 test innings. Asad, on the other hand, made number 6 popular again. 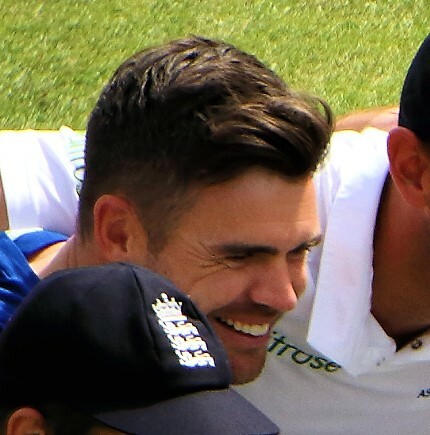 During these 8 years, he became the most successful test number 6 ever scoring more runs at that position than anyone (barring Steve Waugh) in the history of the game. He also created the record of scoring the most test centuries from number 6, breaking a record held by Sir Gary Sobers! Azhar and Asad were more than ready to take charge of Pakistan's test batting when Younis and Misbah bid adieu to the game. 12 tests in since the retirement of the two legends, and I have come to realize that Azhar and Asad will never be the test batting greats that they could have been! They have been epic disappointments for Pakistan's test team and I solely blame them for the rut that Pakistan's test team has been for the past 18 months or so. When Javed Miandad and Saleem Malik moved on in the 90s, they passed on the torch to the likes of Inzamam Ul Haq, Mohammad Yousuf, and Younis Khan. When Inzi and MoYo moved on, Misbah Ul Haq joined Younis Khan to take Pakistan's batting forward. Azhar and Asad should have done the same. They were ready and had been groomed; however they have been major failures, which has resulted in embarrassing test losses for Pakistan. To put things in perspective, take a look at the difference in their performance in the two periods. The dip in Azhar's performance is alarming. 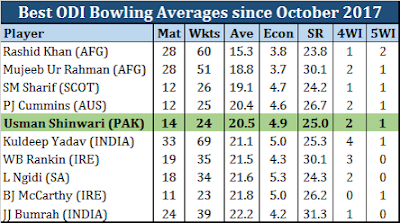 Asad's performance has not decreased as significantly as Azhar's, but when we look at his performances in context of the matches, you will realize how he has been a big reason for Pakistan's failures. 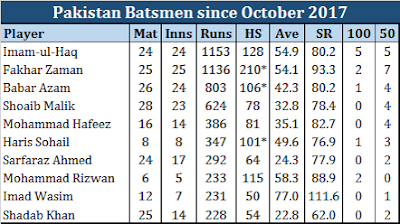 Here's a look at what Azhar and Asad did in the 12 tests that Pakistan have played since Younis and Misbah retired. Pakistan's first assignment in the new era was a two test series against Sri Lanka in the UAE, a fortress for Pakistan where they did not lose a single test series in 7 years under Misbah. In those 7 years, Pakistan lost only 4 tests in the UAE. Sri Lanka, severely depleted themselves since Sangakkara and Jayawardene retired, completely blanked Pakistan in both the tests resulting in Pakistan losing their first ever test series in the UAE since it became their official home. The loss hurt, but the manner of the loss hurt even more. Pakistan lost the first test by 21 runs when they failed to chase a target of 136. Azhar went for a second ball duck and Asad managed only 20. Pakistan lost the second test by 68 runs. In the first innings, Azhar failed to build on his 59 and Shafiq went for 12 as Pakistan conceded a huge lead. In the second innings, Pakistan were chasing an improbable 317 but Asad Shafiq could not close the game despite scoring 112. Pakistan just scraped through to a 5 wicket win thanks to Imam Ul Haq and Babar Azam. Chasing 160, Pakistan were reeling at 14-3 and looking at an embarrassing loss to test first timers. Azhar's 2 and Asad's 1 contributed to the 14-3 situation. Pakistan's test win at Lord's was probably the biggest shock of 2018. The test showed the importance of Azhar and Asad to Pakistan's test team as their innings of 50 and 59 respectively helped Pakistan take a first innings lead resulting in a victory scripted by Mohammad Abbas, Mohammad Aamer, and Hasan Ali. In the next test however, Pakistan succumbed to an innings defeat. Azhar and Asad contributed 2 & 11 and 27 & 5 respectively. Asad had a decent series with scores of 80, 41, 0 and 44. Those scores show that he has the ability but they also show his lack of concentration, focus, and motivation to build on a laid platform. Azhar, on the other hand, continued to disappoint, with scores of 18, 4, 15, and 64. While Pakistan won the series 1-0, it could have very easily been 1-0 to Australia had Fakhar and Sarfraz not saved them from 57-5 in the first innings of the second test. That scoreline of 57-5 was 57-1 at one stage before Lyon wrecked havoc with 4 wickets in 6 deliveries including Azhar (15) and Asad (0). Azhar and Asad continued to disappoint against New Zealand as their failure resulted in Pakistan losing the first test of the series by a mere 4 runs. They failed to capitalize on their platform in the first innings falling for 22 and 43 respectively; and then miserably failed in the second innings as Pakistan failed to chase a target of 176. Asad fell for 45 while Azhar was last man out for 65 unable to score 5 more runs required for a win. Pakistan won the second test quite comfortably and Azhar added 81 to an innings dominated by Haris Sohail and Babar Azam. Asad could only manage 12 runs in Pakistan's solitary innings. The third test of the series, and 10th test since the retirement of Younis and Misbah, finally showed the world what everyone had been waiting for. Azhar and Asad came together at 85-3 and put on a 200 run partnership for the 4th wicket. Both knocked centuries with Azhar scoring 134 and Asad 104. Had they finally arrived as the batting leaders they were supposed to be? Their partnership helped Pakistan secure a first innings lead and a possible series win. But that was not meant to be, as Pakistan's batsmen failed to survive two sessions on the final day and crumbled for 156 in a match that could have very easily been drawn had they just batted the day out. At a time when Azhar and Asad just needed to put on a rearguard they disappointed in epic proportions falling for 4 and a first ball duck respectively. The end of 2018 and beginning of 2019 brought the toughest test yet for Pakistan's batsmen. No one expected much of them on this ongoing tour, but one at least expected some sort of fight. In the first test, Pakistan managed only 181 with Azhar and Asad contributing 36 and 7 respectively. Pakistan's bowlers did really well to restrict South Africa's lead to just 40 odd runs and then Imam Ul Haq and Shan Masood played beautifully to wipe out that lead and take Pakistan to 100-1 at Tea on Day 2. A lead of 58 runs, 9 wickets in hand, and a fantastic chance to pile on the pressure on South Africa and bat them out of the game. The stage was set for Pakistan's leading batsmen to capitalize on a brilliant platform set up by Imam and Shan. Azhar walked out to bat with Imam falling right after tea and Pakistan's score at 101-2. Azhar lasted only 3 deliveries. Pakistan 101-3. Asad walked out and back to the pavilion soon too leaving Pakistan on 134-4. Their failures, yet again, resulted in Pakistan setting a target of 149. Game over. Similar failures continued in the second test as Azhar and Asad fell for 2 and 20 respectively in the first innings. When Pakistan batted again, they were facing a deficit of 254 and a likely innings loss. Azhar failed again scoring only 6, and Asad just delayed the inevitable with a meaningless knock of 88. I say meaningless, because I am amazed at how many irrelevant runs Asad has scored. A century while chasing 500 to win a test, a century when the top order has already piled on 250+, an 88 that takes you no where. There was a stage when Pakistan were 190-3 with Asad and Babar Azam at the crease. The deficit was 60 odd, Asad was in his 80s and Babar was knocking it well and had raced to 30 odd. That was the time when a batting maestro like Younis or Misbah, or even an Inzi or MoYo, would have grasped the opportunity, scored a big test hundred, and given Pakistan an outside chance of a win with a target of 150+. What does Asad do? Throw it all away like always! It is just sad that Azhar and Asad have not been able to become the batsmen that they should have. They will always remain average test batsmen who could not take the next step and evolve into true batting greats. They have had all the chances in the world. They have had the best grooming possible by sharing a dressing room with Younis and Misbah for 7 years and by batting with them in the middle for 7 years in over 50 tests. There could not have been a better way to master test batting. And there could not have been a better time for Azhar and Asad to stand up and be counted among the batting greats of this era. Unfortunately that will never happen now. What epic failures these two have been.